And here you see the drawing of today, made by Kata from Hungary. It represents 1 of the 10 proverbs of this video. By the end of the lesson, I show you the drawing again. Your task to guess which proverb it is. Let’s start with lesson 18, containing proverbs 171-180. Literally: to have a stay overnight in the monkey. The meaning is to get into troubles, usually while you did not expect. The expression sounds of course a bit strange. How could you stay overnight in a monkey? Well, it is believed there used to be a guesthouse in Amsterdam, which was called “the Monkey”. It doesn’t exist anymore, but if it would, it probably would have the worst possible reviews on Tripadvisor. It was considered highly uncomfortable and it was said that the clients were cheated. Literally: to have an apple to peel with someone. An English equivalent would be to have a bone to pick with someone. The meaning is that you are angry with someone and ready for a confrontation. It is believed the original expression was not to peel an apple, but an onion. And we all know crying is the result of peeling an onion. Literally: to put the flowers outside. The meaning is to have a party. The expression is mostly used to stress your plans for tonight: vanavond ga ik de bloemetjes buiten zetten. An English proverb with the same meaning is: painting the town red. The origin of both the Dutch as the English proverb is the habit of decorating the houses when there was going to be a party in the city. And of course you understand, that we in Holland, decorate our houses with flowers. And that is another proverb about flowers. Literally: the death or the gladioli (plural of gladiolus, which is a flower). Dutch cyclists started to use the expression at the end of the seventies. The meaning is: all or nothing. And you use it when you need to take (much) risk in order to win. So, either you die or you get the flowers for the victory. Whether the Dutch cyclists are also the inventors of this proverb, is not so clear. There are some interesting theories. One theory says that the origin is the roman gladiator fights. The word for sword in Latin is “gladio”. And the winner of those fights got gladioli. Another theory is the Nijmegen four-day March, which is a big and historic event in the Netherlands, where participants march 50 kilometres per day during 4 days. The tradition is that the street, which they pass just before the finish, is called that day “Via Gladiola” and the spectators give the gladioli to the participants. Literally: to choose eggs instead of money. You use the expression in a situation when someone is forced accept a lower compensation than he was initially hoping for. For example: someone is selling his house. Initially, there was no intention to sell it quickly, but then he got a job in another city. At this moment, there is only one potential buyer who bids 20% lower than the asking price. When the seller accepts, you can say: “hij koos eieren voor zijn geld”. Literally: every other oat-punch. The meaning is: very frequently. And you use it to express some negative event happens often, or to stress some repeated negative behaviour. For example: he used to arrive late, “hij kwam om de haverklap te laat”. Another example: recently there are frequently burglaries in the neighbourhood, “de laatste tijd wordt er om de haverklap ingebroken in onze wijk”. Literally: to cry while wearing a cap. You use it, when you want to stress when some performance or organisation was really bad, highly unprofessional. For example, the football team lost 8 to 0. “Het was huilen met de pet op”. Literally: the last pieces of lead, are the heaviest. The meaning is used, when most of the job is done, but you still have to go through the last phase in the process, which appears not be the easiest part. For example, a marathon runner will agree that the last 10 kilometres are much more difficult than the first 32. The origin of this expression is the ancient technique of printing. Someone had to put the letters made of lead into a matrix. He was holding the letters in one hand, and used the other hand to put them in the right order. Of course this hand got more and more tired, as the job progressed. Literally: to touch someone at the tooth. The meaning is to question someone in a strict way, usually with the goal to find out who is guilty or what happened. Again this is an expression related to horse-trading. Remember the expression of lesson 10, that you should not watch in the mouth of a given horse. Also this expression is related to the way of determining the age of a horse, by its teeth. Literally: make your chest wet. You use this expression to tell someone, that something is going to be heavy and difficult, and you warn not to underestimate a future job. But at the same time, you challenge and encourage. For example, a teacher is handing out the exams. He can use the expression, and by doing so, he says the exam is difficult, but it is also a way to encourage one to get the best out of himself. The origin of this expression is a habit of sailors. They used to get wet when executing extremely difficult tasks. To make your body get used to the cold water, they made their chests wet before starting the job. By doing so, they showed they did not underestimate the job, as they expected to get wet. Here you see Kata’s drawing again. It is one of the proverbs of this lesson. I hope you are able to determine which proverb is represented here. Make your chest wet for the next lessons. The last leads will be the heaviest. 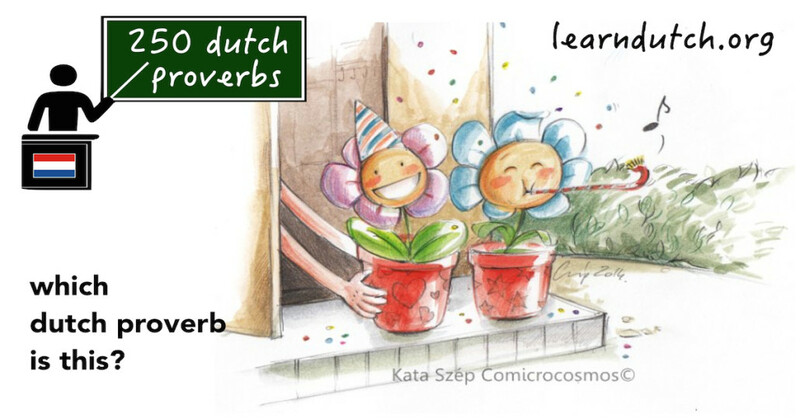 See you back in lesson 19 of 250 Dutch Proverbs.